As parents of a 2 year old we’re often the source of advice for friends who are expecting a baby or who’ve just become new parents. One question I get asked is, "What product would you recommend for our new baby?" And my answer is always Grobag Baby Sleeping Bags. Grobags are little sleeping bags that allow babies to move their arms which keeping their bodies and legs snug and come recommended by the British foundation for prevention of SIDS- sudden infant death syndrome. They come in sizes from 0-6 months (7lbs-or 3.5kg) up to 3 years, with loads of funky designs and colours. During those first few months grobags kept our son at a consistent temperature - so no need to wake him up in the night to check he is wasn’t too hot or too cold (yes, new parents really do this)! It also meant that he couldn’t kick off his blankets in the night, solving many of the problems usually associated with sleeping away from home, not to mention the trauma of moving from a bassinet or moses basket to a bigger cot. When used as part of a night time routine they can help your baby establish the difference between day and night, helping with any “sleeping through the night” problems you may have. 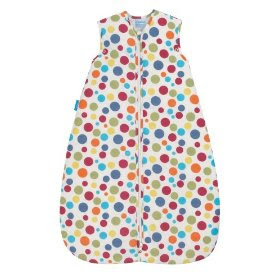 And one more plus - want to keep using a Grobag Baby Sleeping Bag even as your baby gets a little older? No problem! They can’t climb out of the cot in one, so no need to move them to a bed until you really need to! I have the exact same one as pictured! It's better than any of the other brands because it has a special flap in the back so you can thread straps through e.g. if you want them to sleep in their pushchair or carseat in their sleeping bag. Also after you do the front zip up there is another flap that closes over the end of the zip so that your baby can't unzip it themselves. Well, a wiley toddler might work it out, but mine hasn't bothered yet. And yes, she has just turned two and not climbed out of her cot yet - thank G'd!! what's the difference between a pushchair and a buggy? From this, I think pushchair is possibly the better terminology as it is an umbrella term whereas buggy seems to be a specific type of pushchair. Nappy is short for napkin which was the traditional thing tied round a baby's bum. But where on earth does the word diaper come from?? according to the mothercare website buggies and strollers mean the lightweight, umbrella fold ones, like maclaren etc, whereas pushchairs mean the sturdier, from birth type, like peg perego, bugaboo, etc. Pushchair is also the all inclusive British term for anything you push a baby in, so prams, buggies etc, are all different types of pushchairs. Clearer?